This is about documenting getting Linux running on the late 2016 and mid 2017 MPB's; the focus is mostly on the MacBookPro13,3 and MacBookPro14,3 (15inch models), but I try to make it relevant and provide information for MacBookPro13,1, MacBookPro13,2, MacBookPro14,1, and MacBookPro14,2 (13inch models) too. I'm currently using Fedora 27, but most the things should be valid for other recent distros even if the details differ. The kernel version is 4.14.x (after latest update). The state of linux on the MBP (with particular focus on MacBookPro13,2) is also being tracked on https://github.com/Dunedan/mbp-2016-linux . And for Ubuntu users there are a couple tutorials (here and here) focused on that distro and the MacBook. Note: For those who have followed these instructions ealier, and in particular for those who have had problems with the custom DSDT, modifying the DSDT is not necessary anymore - see the updated instructions below and make sure to update your clone of the roadrunner2/macbook12-spi-driver repo to get the latest drivers. If you want to keep your MacOS installation (generally a good idea if you can afford the disk space, because that's the only way to get/install firmware updates), then first boot into MacOS and resize the partition there, creating a new partition for the Linux installation. If you also want to have a Windows partition, see this comment below. Warning: If you're not going to keep MacOS, either back up the EFI System Partition (and restore its contents to the new ESP after installation) or leave it intact (i.e. don't do a full disk install, but just use the space after the ESP). This partition (it's the first one) contains drivers/firmware/etc needed by Apple's EFI loader during boot, in particular to initialize the Touchbar. Since the internal keyboard and touchpad won't work until you have built and loaded the drivers, you'll need to plug in an external USB keyboard to do the initial setup and installation. If you're booting a 4.11 or later kernel, no special params or patches are needed. If you're booting a kernel < 4.10 then you'll need the following kernel param to boot properly: intremap=nosid. E.g. Lastly, if you are booting a live CD or similar with a kernel < 4.9 then you will also need to add the nomodeset kernel parameter to your kernel line; you will then not have proper HiDPI detection or accelerated graphics. For this we need the drivers from https://github.com/roadrunner2/macbook12-spi-driver.git (a clone of https://github.com/cb22/macbook12-spi-driver which includes a preliminary touchbar driver and keyboard fixes). The following commands set this up. The touchpad defaults to using the bottom-left corner for right-clicks - to get 2-finger right click, install the Gnome tweak tool and change it in there. it has an extremely low sensitivity - you must be within a few feet of the base station, and even at 5 feet distance it shows a weak signal. it stops working after 10 or 15 or so minutes; turning WiFi off, waiting a several minutes, and then turning it back on generally gets it working again. Maybe a thermal issue? The amdgpu driver works well and is automatically loaded on MacBookPro13,3. On the 13 inch models the use of the intel Xorg driver may need to be forced (see first comment below). The dGPU needs to be manually disabled after each boot and first login with sudo systemctl start disable-dgpu - trying to have it run automatically at boot via systemctl enable disable-gpu leads to hangs. The amd driver does not handle disabling and re-enabling the of the dGPU very well. In particular system shutdown may hang or just take several minutes, and you may see various errors in the kernel logs when disabling and re-enabling. If you boot into MacOS, then when booting back into Linux you'll need to change the default gpu back to the iGPU again: boot, run gpu-switch/gpu-switch -i, and reboot. For MacBookPro[13,14], you need the bcwc_pcie driver (mainline branch) - see also https://github.com/Dunedan/mbp-2016-linux/issues/15. apply the patches from hci_bcm-4.13, hci_bcm-4.14, or hci_bcm-4.15, depending on whether you have a 4.13 or earlier, 4.14, or 4.15 kernel. on 4.14 and earlier apply the service patch from the above comment and start the service as described there (not necessary on 4.15 and later). Note that as of 4.16 there are still issues on MacBookPro13,1 and MacBookPro14,1 - see the above bug for details on what additional patches are needed. Regarding the screen resolution issue: That appears to be a bug in the EDID data provided by the display. Happens on the 13,2 as well (https://github.com/Dunedan/mbp-2016-linux#screen). It could also be that the displays have a higher resolution as advertised, but as Xorg correctly probes the right resolution I suspect it being a bug. Hardware accelerated graphics output is also no problem with the integrated intel graphics card on the MacBookPro13,2. I just had to force Xorg to pick the intel driver (with Debian). I did a quick try with 0ad and that runs really smooth with >50fps with highest graphical details and native screen resolution. Settings the screen brightness works also out of the box with Debian. The UX isn't that nice, as there are no dedicated keys for doing it, as the Touch Bar isn't working yet and the integrated ambient light sensor isn't working either yet. But in KDE I can easily change it via the power management settings. I have the problem from time to time that NVMe isn't properly working at boot and I have to restart to get it working. Do you have the same issue as well? I thought it could be related to the queue depth related workaround from https://github.com/torvalds/linux/blob/v4.10-rc5/drivers/nvme/host/pci.c#L1619 which is in place for the MacBook8,1, but not yet for the MacBookPro13,x, but I haven't tried it out yet. I also have no problem with the spurious events from the Touch Bar you mention, don't know why. No, so far I've not any issues with the disk at all - must be due to the different controller I guess. [    1.627562] [drm:amdgpu_init [amdgpu]] *ERROR* VGACON disables amdgpu kernel modesetting. [   11.912424] [drm:amdgpu_init [amdgpu]] *ERROR* VGACON disables amdgpu kernel modesetting. How is it showing up on your system? Without a pci bus id, I don't know how I'd tell xorg to use the card. so wrong resolution and wrong physical size/dpi. Regarding the wrong resolution with fbdev: I get the same if I boot with modesetting disabled. If I boot with modesetting enabled the screen becomes unreadable during boot, but Xorg starts properly and I get the correct resolution afterwards. If I then in addition force it to use the intel driver I get a pretty decent graphical experience. Well, your comment prompted me to test again, and it turns out that with the 4.9 kernel kms works 🎉 So thank you! And as you say, it then discovers the correct resolution, and even plymouth and gdm then properly detect HiDPI. I can then run both X and Wayland, and AFAICT graphics performance is good. I still don't see the Intel GPU, but at least the AMD one now works well. Hi and thanks for this nice walk-through. I got stuck at mv ...the-attached-dsdt.dsl.patch... dsdt.dsl.patch as I don't know where to get from ..the-attached-dsdt.dsl.patch.. I just noticed I had to "Download zip" on the upper right of this page. I was able to get my MacBook Pro 13,3 working with these instructions. Unfortunately, the wireless card is still flakey. It sees it but when I try to attach to the SSID, it just drops me. For the loading of the additional modules, add applespi intel_lpss_pci spi_pxa2xx_platform appletb to the MODULES in /etc/mkinitcpio.conf. @roadrunner2 @Dunedan Many thanks for your contributions! I managed to install Ubuntu 16.04.1 and got it booting using nomodeset. I then upgraded to the mainline 4.10.1 kernel in order to get proper HiDPI detection and booting without nomodeset, but it gets stuck at fb0: EFI VGA frame buffer device. Any ideas on what's going on? Is there a proven kernel version which works? A description of your stable setup would be super-useful here. I'm currently trying to get the keyboard and touchpad working, after which I shall be able to assist with bugfixing and potentially upstreaming these patches. Got it working by running a dist-upgrade. Now amdgpu initializes properly and I get correct HiDPI detection. I'm on kernel 4.10.1-041001-generic. I also got the touchar/touchpad/keyboard working after some hackery, because mkinitramfs wouldn't use the patched DSDT. I had to install dracut and generate a new image with the patched DSDT. I also got the touchar/touchpad/keyboard working after some hackery, because mkinitramfs wouldn't use the patched DSDT. Do you have any idea why it didn't accept it? Any particular errors? Did you try running mkinitramfs with -v? Or are you saying that mkinitramfs ran fine but when the kernel booted it didn't pick up the new DSDT? @roadrunner2 Thanks! mkinitramfs ran fine, but the new DSDT wouldn't be picked up. does not work either. I will try to use the patch you named for the 13,1 and 13,2 to see if that helps. What model is the SSD you used? Mine is listed as "Apple SSD SM0512l"
@Camicaze What is the pci id of your NVMe controller? (lspci -nn | grep NVMe ) On mine it's 144d:a804. Also, from the model number it seems you have the 512GB SSD? Mine is the 1TB and shows up as "APPLE SSD SM1024L". 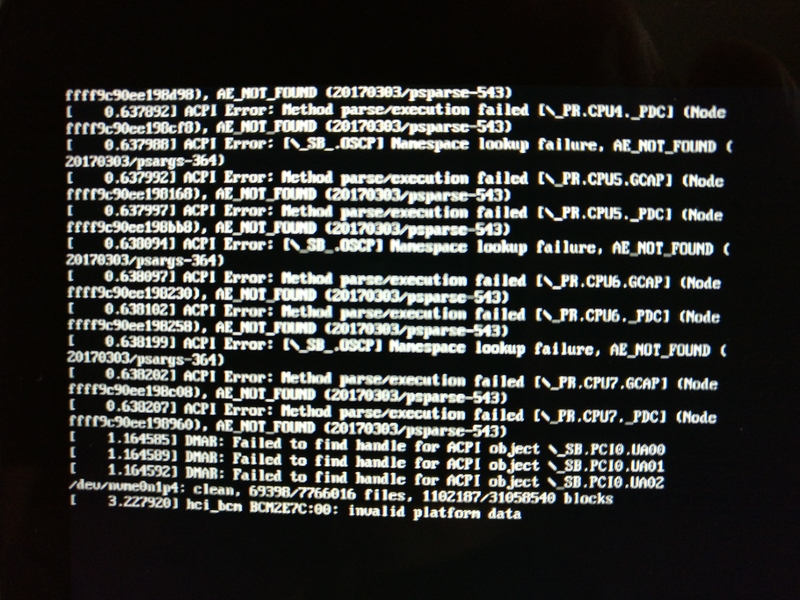 I just tried to get Fedora working on my MacbookPro13,1 and failed miserably, because of the nvme problem. Using the commands modprobe nvme; echo 106b 2003 > /sys/bus/pci/drivers/nvme/new_id made it possible for me to get through the installation process, but it just won't boot afterwards, since the command is not a permanent solution. My question is, how to boot the system to patch the kernel? Do I have to patch the files using the LiveUSB environment? I'm relatively new to Linux, so I would be really glad if somebody could help me finding a solution. Then reboot. What this does is intercept the modprobe nvme operation to both load the module as well as add the desired id. If this works (as I think it does) then I'll update the instructions above. After running all commands without any error messages, I tried to boot the system but had no success. At the end it says, that /dev/disk/by-uuid/... does not exist, which is my root partition. Have you got an idea how to solve this problem? @roadrunner2 That's absolutely no problem. I've learned from my mistake so it was actually good to figure things out by myself. I've tried forcing to load the module with the command above, but it didn't work either. It seems like the file /etc/dracut.conf.d/disk.conf is empty after running the command? I still get the same error message while booting. Could it be possible, that Fedora is the problem? I installed an rc version of the 4.11 Kernel while chrooting (since the nvrm bug should be gone in this version), but with the new kernel it doesn't even start booting at all. As not even starting to boot, that is probably some other issue then. If you're trying out the 4.11 kernel, you might want to remove that /etc/modprobe.d/nvme.conf we created earlier, though I don't think it should cause issues. EDIT: Well, one problem goes and another one comes, haha. I updated the kernel to the latest version (4.10.10, not the experimental 4.11) but grub just won't load it. I can boot the old kernel (4.8.6) without any problems now, but choosing the new one ends up in a black screen right after hitting enter. I don't even get a single system message and nothing is written in the log files either, which I accessed with the command journalctl --boot=-1. Have you got an idea on that? You can determine the version by looking at the names of the files /boot/vmlinuz-<version>. Experts, I am very keen to run linux on my mbp-2016 but obviously I got stuck at the well known issues addressed in this project. I got to the point to build a live USB for fedora25 ubuntu1404 and ubuntu1610 but obviously everything hangs at the beginning of the boot. I am very happy to hear that most of the problems are addresses. But I don't understand how to apply the fixes that you have found. (dracut --force --kver 4.10.10-200.fc25.x86_64). I rebuilt it several times now, but my mac just won't start doing anything after choosing the newer kernel. I added the -v option to the dracut command and didn't get any error messages. So the build of the initrd seems to be ok.
@ltosolini: Ubuntu 14.04 definitely won't work - the kernel is way too old; Ubuntu 16.10 appears to have the 4.8 kernel, so that should sort of work. @roadrunner2 My grub.cfg already contains the command intremap=nosid, since this was on of the first things I did when the first boot succeeded. And I already tried removing the quite option and using nomodeset, without any success. It seems like grub doesn't even start loading the kernel. I'm going to try another Fedora image now, since I tried to use Fedora Spin KDE Plasma Desktop before. Maybe I won't have any problems regarding the kernel with the normal Fedora Workstation. I'll keep you updated. Have a nice day! drwxr-xr-x   3 root     root            0 Nov  7 10:59 . I've been waiting at this point for about 30min and nothing happens. So apparently it successfully loads the kernel and the ramdisk, right? So what could go wrong after that, which causes the system to freeze? Sorry guys, I think I am missing a piece of the story. using a stock fedora25 64bit image to build a live USB media. This way it is booting fine all the way to initial user selection screen but then I am stuck here because mouse and keyboard are not working. If I boot this USB drive on another PC it boots fine but I see that it runs kernel 4.8 which I understand is too old for mbp; so what I don't understand now is how to upgrade the kernel if I can not use mouse and keyboard? And also how to do the other operations suggested in this thread if I don't have a workable system! when I boot fedora25 from the live USB drive I get the grub menu and if I press 'e' on an entry I can edit that entry. The problem is when I am done with editing, I have to press either CTRL-x or ESC to move forward but I am not able to find any key combination to get either CTRL or ESC. Any idea? @fannullone Kernel 4.8 should work well enough to get started, so that's not the issue. You get a working keyboard have essentially two options: either plugin in and use an external USB keyboard and mouse, or modify the initrd you're using to boot (/images/pxeboot/initrd.img) to contain the modified DSDT and the applespi and appletb drivers, as explained Keyboard/Touchpad/Touchbar section above. As to editing grub at boot, that is a definite problem for which I have not found any solution so far either 😞 (ctrl does work for keys, such as ctrl-c, ctrl-a, and ctrl-e, but no idea why not for ctrl-x). @B14ckSh4d0w That initrd doesn't look right: it's A) missing the dsdt.aml in the header part (where you see the early_cpio and microcode files), and B) the main part does not contain the applespi or appletb drivers (nor even the spi_px2xx_platform driver). Having said that, that by itself can't be the reason why it's not booting (it would just mean you end up with the keyboard not working). Though, hmm, I do see a /etc/cmdline.d/20-force_drivers.conf in your initrd - if that specifies drivers that aren't actually in your initrd that might be an issue. I am using a 13,1 and thus cannot see the SSD without a kernel patch, or kernel version 4.11. I found a utility called isorespin.sh which makes it easy to update an Ubuntu/Mint ISO file with a newer kernel. This made it possible for Linux to see the SSD and install onto the MBP. However, I was not able to get the internal keyboard and touchpad to work. I'm probably missing a step. So, to make things easier I thought I'd try Fedora to be able to follow your method better. How do you patch the installation media so that the Fedora installer can actually see the hard drive? @nathanchilton Re-creating the initrd as I describe in "Booting" section above should do the trick, I believe. With your patches keyboard and touchpad are working. Is there a way to get audio working? Also the 4.8.6 initrd (link) isn't that different compared to the 4.10.10 one. Another thing I've tried is to use the Fedora 26 Alpha .iso (since it worked for @ezdora), but the Live USB isn't even booting. It's just the same as if I would try to boot Fedora 25 with an updated kernel. So, after all, I will run Fedora in a virtual machine now (as a provisional solution). But thank you anyway for all the effort you made! I really appreciate that. Have a nice day! If I boot with Fedora25 and the keyboard/touchpad/touchbar is not working how can I possibly modify the initramfs as described in the 'keyboard/touchpad/touchbar' section? @fannullone, a USB keyboard should work just fine. I haven't been able to get the internal keyboard/touchpad to work, but it seems that I am the exception. I don't understand what this change is meant to accomplish, so I'm not sure if I should mess with it or not. @fannullone As @ManWithCamera says, plug in a usb keyboard. @ManWithCamera I guess you have a different model than I do, but that's ok: the point of this part of the patch is just to bump the version of the dsdt (otherwise it won't override the existing one, so if you left this as is that would explain why your new dstd isn't being used and your keyboard isn't working); i.e. change the 0x00130001 to 0x00130002. @roadrunner2 thank you so much for this work. Great. I have a Macbook 13,3 and I had to remove the the first section covering 13,1 and 13,2 Macs from the patch in order for the hwdb to compile successfully (and thus the patch to work). Helped to read up on evdev and learn the command for triggering a manual hwdb recompile but not sure if that was necessary. I am running Debian Testing and haven't been able to get the amdgpu Pro driver to compile due to changes from the Stable distribution I think, but Xorg is running fine with the ati module and Debian's amdgpu kernel module (except for screen dimming, and the dpi was way off (96). startx -- -dpi 150 seems to make things about the right size. @cworth Thanks for the report on the hwdb - looks like I was missing an empty line there - sorry about. Fixed now. I have not tried the amdgpu-pro driver, only the admgpu one in kernel 4.10 - I didn't need change the dpi when using that (though I did change the screen-resolution in gnome's display settings to get things a bit larger). Lastly, I presume you followed the instructions in the "Screen Brightness Control" section above? And it still doesn't work? Did you verify the modified apple-gmux module is being used? (e.g. check the filename in sudo modinfo apple-gmux, and try explicitly loading your patched apple-gmux with sudo rmmod apple-gmux; sudo insmod ...../apple-gmux.ko). @roadrunner2 good to know empty line fixes the patch. Just had success adjusting the backlight for apple-gmux. And now, the touchbar buttons work too. I had to reinstall at least once so maybe that fixed it. I am still trying to get the brightness working on my MacBook Pro 14 with Ubuntu 17.04 and Kernel 4.11.4 [Update: wget did the trick; works now]. In case you have trouble selecting a working usb wifi adapter: TEW-649UB did the trick for me; see also https://github.com/pvaret/rtl8192cu-fixes . @roadrunner2, in case you would like to update your text nosid seems no longer required from kernel 4.10 on (correct?). "The touchbar driver is called appletb. It provides basic functionality, enabling the touchbar and switching between modes based on the FN key. Furthermore the touchbar is automatically switched off if no (internal) keyboard, touchpad, or touchbar input is received for 60 seconds; any (internal) keyboard or touchpad input switches it back on." Unfortunately my touchbar stays on, any idea why? Thanks a lot to all of you and especially to @roadrunner2 and @Dunedan. Audio seems to be the last big issue (for me). Dual screen (USB-C to HDMI) works great. @dfb8085, what I did was to download the Ubuntu 17.04 ISO (16.04 will work the same way), then use isorespin.sh to change the kernel to 4.11.4 (the command will be isorespin.sh -i [your iso] -k v4.11.4), and finally use unetbootin (available for Linux and Mac) to create a LiveUSB. Next, you have to boot using Mac's option key and then follow @roadrunner2 instructions. @kjano Thanks for the pointer about intremap=nosid not needed anymore - verified that indeed 4.10 and 4.11 boot fine without it, and updated the doc. Regarding the touchbar timeout, sorry, that info was a bit out of date - I've updated the README now. Lastly, since you say you have a new MBP14,* model, could you possibly verify the touchpad has the same ranges as the corresponding 13,* model? To do that please get the latest drivers from repo, add CFLAGS_MODULE=-DDEBUG_TOUCHPAD_RANGES to the make modules command, and rebuild and reload the applespi driver; then move your finger to all edges of the touchpad and you should see the ranges being reported in dmesg; finally if you could report the largest (last) range printed here, I can make any necessary adjustments and send a pull request. TIA. I have done all steps including "add the modules (listed in keyboard.conf) to /etc/initramfs-tools/modules"
@dfb8085 Sorry to hear you lost your changes. The tutorial above assumes you're installing Linux on the disk. You can certainly modify the USB instead, but the details of that depend very much on the distro you're using: basically you'll need to find the corresponding places on your USB disk where the kernel, ramdisk, modules, etc are stored, and update those locations instead of the regular ones. I don't know the Ubuntu Install/Live disk layout, so I'm not sure I help you with concrete instructions. You say have a "persistent USB" - does that mean you made it persistent as decribed in these instructions? Or are you using http://www.linuxliveusb.com/? If the latter, then the FAQ there indicates that doesn't work for system updates, so you probably need to modify the base system it's based on. E.g. looking at the Fedora Live USB I have, I see that the booted kernel image and ramdisk are in images/pxeboot/, so you'd want to update the ramdisk there; the full root filesystem is found at LiveOS/rootfs.img inside LiveOS/squashfs.img, so you'd need to ensure that is mounted and your modifications are made to that. The details for Ubuntu will be different, of course. @roadrunner2 Are you aware if the 4.12 kernel will fix any of these issues? @drewjohnson2 AFAIK 4.12 does not contain anything particularly relevant to this. There are some Thunderbolt and USB-C improvements, but I'm not sure that they do much for us here. "it stops working after 10 or 15 or so minutes; turning WiFi off, waiting a several minutes, and then turning it back on generally gets it working again. Maybe a thermal issue?" Could this be harmfull for my MacBook? And what do they mean with: " uname -r "
I mean i suppose that i have to fill in my username, but what do i have to do with "-r"
Not sure; but so far I haven't noticed anything. That's a command that returns the version (release) of the currently running kernel (see man uname) - the backticks (`) cause the relevant part to be replaced with the output of the command. In short, you should type those commands in exactly as shown - don't replace anything. The only places where you need to manually replace something in the commands above is when I wrote something in <>'s (e.g. <kernel-version>). And install Linux on that partition with your bootable USB. Then just use rEFInd as bootmngr. In this way they don't "fight" with eachother. I know this probably doesn't affect your machine, but I'm wondering if you may have any thoughts on the problem with the NVMe at boot time (from this comment and downward). And thanks for the fix of the touchpad init, I'm using it on linux-next right now, and I'll let you know if I find any problems. @peterychuang I've seen that thread, but no, don't really have anything to add, except for a question which I'll post there. @dylanprins Thanks for that info - I'm sure other readers will find it useful. Is there somebody who got a working triple boot MacBook pro 2017? Maybe it's obvious but where should one put the boot loader when installing Linux on a new partition created from within MacOS? I have a MacBook Pro 2016 model 15'' and I've tried to install KDE Neon with the 4.13-rc3 kernel and Kubuntu with 4.11.4, upgraded using isorespin. With KDE Neon, I'm getting an error from ubiquity at the end of the install saying it was unable to create a boot loader. I tried placing it on the same partition as KDE Neon, on a separate small parition formatted as both efi and fat32 and even on the same partition as MacOS, but no dice. Starting ubiquity from a terminal and setting the -b option to skip that step, I can successfully install KDE Neon, but of course KDE Neon is nowhere to be seen when I boot the computer. I have rEFInd installed, so maybe I need to configure it to find the install somehow? With Kubuntu, I didn't encounter any errors during the install, selecting the same partition for both Kubuntu and the boot loader, but after install I only got a black screen and was unable to boot into anything but the MacOS recovery partition (holding Command+R while booting the computer). Neither live USB was able to boot into Linux without setting intremap=nosid, in spite of both having kernels > 4.10, and I had to attach an external keyboard and mouse to be able to do anything. I'm definitely doing something wrong, but I don't understand what. @fleskesvor I just installed gnome on my macbook pro 2016 and had the same issue when I first started, if you are still stuck I can post the steps I took to install it. I took a bit different of an approach than what I've seen here or here I think it's a bit simpler and can post them if you want. @roadrunner2 With my new MacBookPro14,2, the Ubuntu 16.04.3 installer is not recognizing my hard drive at all, even though I have a nice, empty FAT32-formatted partition ready for it. The USB stick with the installer is mounting as dev/sda, and neither gparted nor fdisk -l recognizes anything about the hard disk, not even the (unreadable) macOS partition. There is no /dev/sdb. Something to do with Apple's new FS? There is space available to the installer - I just can't get the installer to see it. I've gotten ubuntu 17.10 and built the latest 4.13 kern, everything is stable currently but I can't get the amdgpu to power my 4k external display (LG31MU97) using a display port adapter (Starfield tech usbc -> dp). It seems amds primary activity has been in the 4.12 kernel, I was able to boot into it but I think I may be missing some CONFIG_* options because it made no difference- though the drm is no longer spamming "clock recovery failed." errors it still doesn't power up the 4k monitor. Xrandr detects the resolution and mode, but fetching the edid data for my second monitor shows "too many extension blocks". I'll pickup some new cables and see if that helps, if anyone has found a specific adapter that works I would love to know what kind. Thanks! edit: I was able to get the 4k monitor running 4096x2160@60hz even though my monitor complains about the cable. All kinds of errors in dmesg about related to atomic access & buffers.. but it does work at least. I imagine it will be a while before this branch makes it to any stable ppa's, but if anyone knows a maintained one building these let me know. @fleskesvor Since these machines are EFI based, the bootloader does not get installed into a partition (or MBR) like for BIOS based ones. Instead, your distros installer should automatically be creating a top-level directory called EFI (exactly like that) on one of the partitions, and placing the appropriate grub files there (usually in an appropriately named subdirectory) - the EFI firmware will look for that directory on all partitions. You don't need to install rEFInd or other EFI boot manager, unless you really want to - Apple's boot manager works just fine (hold down the alt/option key after powering on to get the list of bootable OS's). I'm not familiar with KDE Neon, ubiquity, or Kubuntu, so I can't comment on the specifics of those. But they should recognize this is an EFI machine and do the right thing. Needing an external USB keyboard and mouse is expected, until you build the applespi driver and load it. Lastly, regarding still needing intremap=nosid: that's interesting, not sure what's going on there - maybe something special about the kernel used on the Live USB (we've similarly seen issues with Fedora's Live kernel (#23) which appears unable to boot properly (no display), despite everything booting fine once installed). @jbadomics There's an issue with recognizing the nvme device on the 13-inch MBP models - see the section "Booting" above. However, Ubuntu 16.04.03 uses an old kernel, IIRC, 4.4, so I think you'll have a bunch of issues with that. At the very least I recommend installing the hardware-enablement stack; better is probably to install 17.04, though. @cstockton Thanks for the info! I have yet to experiment with USB-C->DP adapter - I did try USB-C->HDMI but had no luck, though I didn't spend much effort on it. @cstockton: Thanks for the offer. :) I would definitely appreciate simpler steps to get this working. @roadrunner2: It seems rEFInd was wiped when I had to use the recovery partition, but holding down Alt works nicely for getting the option to boot my live USB, so I'm fine with that. The /dev/nvme0n1p5 is the partition I want Linux on. The /dev/nvme0n1p4 is something I messed around with when I couldn't get things to work, and it turned out bigger than intended because the macOS disk utility was fighting me on the size. The menu for the boot loader wants me to install that on either /dev/nvme0n1, /dev/nvme0n1p1, /dev/nvme0n4, /dev/nvme0n5, /dev/sda, /dev/sda1 or /dev/sda2. How are you installing Linux if you're not using a live USB? Or are you using a specific kernel that's different from the ones I've used? EDIT: Are you saying that instead of formatting my Linux partition as ext4, I should instead format it as efi or boot and install both the OS and boot loader on it? I haven't tried that. @fleskesvor I forgot to clarify one thing: if you're using Apple's EFI loader then the partition with the /EFI directory must be formatted as FAT or HFS+; if you use rEFInd then it has drivers for ext2/3/4. So in my first example I have rEFInd and /boot is ext4; in my second example I'm using Apple's EFI loader, and hence p4 is formatted at HFS+ and /boot is separate (again ext4). Now, for your layout: you probably want to install the bootloader then into nvme0n1p4, since that appears to be an efi partition (presumably FAT), and the main OS on nvme0n1p5 (formatted as ext4 or xfs or whatever you want). With this I assume you're not using whole-disk encryption (well, more precisely whole-partition), since you won't have /boot on a separate partition. Btw., I told MacOS to leave just one large partition (so there were 4 partitions at that point: the main EFI partition p1, MacOS on p2, recovery on p3, and p4 empty) and then let the Linux installer further split that last partition as desired. Typically I install ubuntu server and lubuntu core without all the junk, but ubuntu-server isos are just full of bugs from my experience. The gnome & lubuntu 17.10 images worked fine (few small bugs). This one is what I used: http://cdimage.ubuntu.com/lubuntu/releases/17.10 - here is a gist on the steps. Hope ya get it working! Hi and thanks for this nice writeup. It helped me a lot so far. At the moment I'm stumped with a problem with the Touchpad. I'm on a MacbookPro14,2, running the latest kernel 4.13.0-rc6 and have installed the spi driver. The keyboard and the touchbar are working fine so I assume I got them installed correctly. The issue is now that clicking on the touchpad is registered but nothing else. That means for example I cannot move the mouse pointer. Input device name: "Apple SPI Touchpad"
@stefan-langenmaier Sorry for the delay. my guess is there was an error initializing the touchpad - this would show up in dmesg - look for messages labelled applespi. On the plus side I have just pushed an update with a number of fixes, including surrounding initializing the touchpad. I recommend pulling the latest code and try again. @stefan-langenmaier Btw., if you could report your success or failure with the latest code, either here or on cb22/macbook12-spi-driver#45, that would be much appreciated. @roadrunner2 No worries! Your latest changes seem to fix the problem. My touchpad is working fine now. @dfb8085 Fedora 26 ships with 4.11, and after getting the latest updates it'll put you on 4.12. However, there are issues trying to boot the live images (see also Dunedan/mbp-2016-linux#25) - it works fine after installing, though. Arch is also on 4.11 or 4.12, I believe. I'm sure there are others too. @Michael-Jing I'm sorry, I'm not sure I can help - I have never seen that boot issue, either on my (much) older MBP or the 13,3. But it might help if you can describe the behaviour more accurately. You don't say if you're using Apple's efi manager, or rEFInd, or something else. Do get to the grub prompt (assuming you're using grub)? If so, how far does the boot get? If not, do you get to the efi manager's prompt (hold alt/option after powering on if using Apple's efi manager)? I have a question, everything works fine, but there is one thing I'm very worried about. The fans of my MacBook Pro14,3 never speed up in Ubuntu, so I mean that they never get to higher speeds when the macbook gets hotter. I can get the fans spinning faster by changing the minimum speed of the two fans by editing the "fan1_min & fan2_min" files in /sys/devices/platform/applesmc.768/... manually. Is this normal? or does it only change the fan speed when the macbook get really f*cking hot? @dylanprins: No, that's not normal: on my system they definitely spin up if, say, I'm compiling the kernel. The spin up isn't very aggressive, though, i.e. it will get noticeably warm before the fans increase their speed, though not excessively so IMO. However, some folks have experienced excessive warming too, and some prefer for the fans to kick in earlier - for both there is macfanctld and mbpfan. See the discussion on Dunedan/mbp-2016-linux#13 - basically my experience seems to align with Dunedan's, but you seem to be seeing some more in line with tudorbarascu's. [    1.570133] applespi: loading out-of-tree module taints kernel. [    1.834514] applespi: modeswitch done. Regarding display proportions: I'm running wayland and gnome, and was able to change resolutions (I presume that's what you meant) just fine with the display settings. Am guessing audio still doesn't work? @ghosalmartin to the best of my knowledge it does not. I also played around with HDAJackRetask but without any success. I am using an usb-c audio adapter but this is far from perfect. No, audio via the built-in microphone and speakers does not work; and AFAIK nobody has started looking into it yet, either. I managed to install fedora26 on internal disks and it is booting fine (4.12.13-300.fc26.x86_64). [root@linux macbook12-spi-driver]# find / -name "*keyboard.conf"
@fannullone Sorry for the confusion: you need to download the keyboard.conf from this gist - I've updated the instructions to hopefully make this clearer. Bingo!! It is all working like a charm :-) Thanks everybody for this great great blog!! Now the only one thing missing is audio, I hope soon we could get that as well. @fannullone Regarding audio, it looks like we're getting bluetooth to work (Dunedan/mbp-2016-linux#29), so as a temporary measure with that you can at least stream audio to a BT speaker. Btw, how did you install Fedora 26? Were you able to boot the live image? I'm asking because several folks have reported issues trying to boot it at Dunedan/mbp-2016-linux#25. Looking forward for audio and internal wireless! I can switch tty when i'm in console mode, but whenver i start X11 i'm no longer able o switch tty. @mealissa I'm using Wayland and able to switch vt's without issue, so I think your problem is related to your setup. You can verify the keyboard events for the keys are being generated by running "libinput-debug-events --show-keycodes". @fannullone Good point: I just sent a pull request (cb22/macbook12-spi-driver#47) to fix this; you can also re-fetch my clone to get this. Note that the message will still occur, but the initrd will get built a second time after the driver is built, this time including the driver. @iTechCydia: Are the modules spi_pxa2xx_platform and intel_lpss_pci loaded? (if your kernel doesn't have them, you'll need to rebuild your kernel with a config containing CONFIG_SPI_PXA2XX=m and CONFIG_MFD_INTEL_LPSS_PCI=m). Thank you +++ to roadrunner2 for this gist and to all commenters. I can't pretend to be a complete n00b as I've been using Linux as my main working OS for almost 15 years, the last 6 or so on Macs. But I'm no computer professional and know just enough to get into more trouble than the average person. I'm trying to get SWMBO's new MacBook Pro 14,2 set up and have got a working keyboard, touchpad and F-key-touchbar thanks to instructions given above. It's running Ubuntu 17.04 Mint with kernel 4.14.0_rc3 via isorespin.sh (ta, Linuxium). Boot manager is rEFInd. She'll need to be able to use an external monitor but that remains to be tested. RIght now the main frustration is wi-fi, which is unusable. The network SSID is recognised, I enter the network password, but after a minute of wheelspinning, I get asked for the password again, and again. . . The modules brcmfmac, brcmutil and cfg80211 are installed and the 43602 firmware is in the firmware folder. It looks as if one USB-C port is going to have to be wasted on a Wi-fi dongle. Is there any alternative driving method for the 43602, e.g. one of the older drivers or something with ndiswrapper? @roadrunner2, firstly thanks for your answer. I cheked, everything seems to be fine, i can switch tty using external keyboard but not macbook one. but xmodmap -e 'keycode 68= F2 F2 F2 F2 F2 F2 XF86Switch_VT_2' only works from external keyboard. the point here is if i use "xmodmap -e 'keycode 68= XF86Switch_VT_2'" i can switch tty by pressing F2, but i want use ctrl+alt+f2 instead. @kiwigander: I'm sorry, but I'm not aware of any workaround for the wifi, other than the usb dongle. Feel free to add your voice to the kernel bug, though 😉. I'd be interested in hearing your experience with the external monitor (is it DMPI, DP, etc, and how well it works). @mealissa: I presume running the libinput-debug-events command I mentioned indicates all 3 keys being sent when you type ctrl+alt+f2 on the keyboard? Are you also pressing fn, or are you running the touchbar with mode 0 or 2? @roadrunner2: Ta, SWMBO has announced that she doesn't consider the wifi to be a major, as she's happy to carry a wifi dongle (and a USB-A to USB-C adapter). WRT the kernel bug, is there a page somewhere on "Filing a Kernel Bug for Idiots"? It would be very helpful. Trying the external monitor proved - interesting. Sorry for the lengthy description to follow: brevity is not my strong suit. TL-DR: External ASUS PB27UQ connected via USB-C=>Display Port works fine, with a catch. The monitor works great with my late 2014 MBP and her late 2011? MBA. Now recall that I'm using rEFInd to manage booting on the new MBP 14,2. After installing Ubuntu as I described above, I've got two options for booting it: ("right": boot\vmlinuz-4.10.0-35-generic.efi.signed from 91GiB ext4 volume [that's my root partition IIRC], and "left": EFI\ubuntu\grubx64.efi from EFI). Prior to testing the external monitor I had settled on the right option as the left would stall for quite a while at Failed to find handle for ACPI object _SB.PCIO.0000 (and .0001 and .0002). When I connected the external monitor via a USB-C to Display Port cable, the right Ubuntu boot option started OK, but after a couple dozen lines of startup messages, the screen suddenly changed to uninterpretable snow. The snow did change a bit, as if the video system had gone nuts but things were still happening, but it wouldn't settle into anything readable or usable within 10 minutes. I disconnected the external monitor and rebooted - and the same fault persisted. I tried rebooting into the left option, which did stall for the usual delay at the usual point, but once it completed, it drove the external monitor just fine. The right option still goes nuts, so I assume somehow something got corrupted. I'll probably try a reinstallation - perhaps with Mint rather than Ubuntu (as Ubuntu Mate is a bit odd looking after working for years with Mint Mate). The alternative is to leave SWMBO working in macOS and monitor progress in getting all the MBP gadgetry working in Linux. That's what I did myself originally in 2011 with the MBP when the then-current Ubuntu wouldn't give acceptable video resolution. Her major apps, besides the usual mail and browser, are Scribus, the GIMP, LibreOffice and Moneydance, all available for macOS. If information from any log file would be useful, please give me detailed instructions. you can see XF86Switch_VT_1 but just nothing happen!! if i use external keyboard the line starting with "MappingNotify event... " won't show up. @kiwigander Thanks for the info. Interesting about the two options: I guess the "right" one is booting directly into linux (i.e. without a bootloader, which is possible only on (U)EFI machines), rather than starting grub like the "left" option does. I see the "right" kernel is 4.10 - is the "left" one (via grub) also 4.10? In any case, it might help to try a newer kernel (Ubuntu 17.10 appears to have 4.13 - try taking one from there). What those 000 ACPI objects are, I have no idea though - don't see any such ones in the 13,* dsdt's nor in 14,1 (don't have one from 14,2). But that may not be the cause of the delay: check the dmesg output and see what's going on before and after the delay. Regarding the wifi bug, see the section above on Wi-Fi - the link is there. External monitor on my setup: Fedora26 on mbp13.3 works perfect. Can also rotate the external screen. @roadrunner2 Sorry for the delay. Thank you for pointing out what I should have seen - the "right" kernel was 4.10. Yet I had respun the installation .iso with a 4.14.0rc3 kernel. At this point I'm admitting defeat, at least temporarily, and SWMBO will try out macOS once I get her data across from her current machine. I reckon that either Ubuntu 18.04 (which I assume will be an LTS version) or the first Mint to be based on it may offer an easier path back to Linux. For what it's worth, although USB-C to DisplayPort worked for one external monitor, USB-C to Thunderbolt 2 to Mini-DP did not work for a similar (ASUS PB279Q) monitor. an interesting and helpful topic this. I am currently struggling with the following problem(s). I would like to put Debian Buster as a dual boot option on a macbook pro (14.3 mid 2017, 15 inch 2.9 GHZ). Currently Debian has the 4.12 kernel as default. Repeated many times for CPU0-7. That's it, boot process hangs. See attached photo. Has anyone encountered something similiar and found a solution/workaround?? Any tips and/or pointers much appreciated. @roadrunner2 what are the two sound cards called? No takers? Nobody else experiencing these problems?? @Johnnie390 Those parse errors are normal - I get them too, as well as the failed-to-find-handle and the bcm invalid-platform-data. So those aren't your issue. Can you confirm that the amdgpu driver is the one being used if boot with nomodeset? And what kernel config do you have related to that driver? (grep AMDGPU /boot/config-...). In short, though, I've not heard of anybody having this issue. @nathanielsimonsen Not sure what exactly you're looking for but they show up as card0 and card1 under /proc/asound/. However, I just realized that the card1 directory is empty, so it looks like really only one sound card (/sys/class/sound/ also just shows one card). @mealissa Have you tried setting the touchbar mode to 0 or 2? (echo 2 | sudo tee /sys/class/input/input1234/device/fnmode) When doing so, does the MappingNotify event still show up? (Basically I'm wondering if pressing the FN-key is causing issues). So I did some reading, and came across the fix, I guess for me at least, I am satisfied. Don't Quit, Don't Give up, and If something is broke you don't break it more cause that's not gonna do anything. Type n to create an empty protective MBR. Note that gdisk won’t confirm a change; it’ll just show you a new experts’ prompt. @roadrunner2 here is some test i did trying to make it work! this is 100% xorg issue! but no idea how to fix it!! I think it's kernel 4.13 . But I get a blank screen. Usb is connected via apple usb / VGA adapter. Not sure how to pass kernel params, maybe from the shell? @nathanielsimonsen, I followed up on your suggestions (thanks for posting) but it did not help. The HDA Intel / Cirrus Logic Generic card is now set as default but other than that the speakers and headphone jack remain dead. Consult /var/lib/dkms/applespi/0.1/build/make.log for more information. This is the output of the log. As per my comment above, no luck with ArchLinux Kernel 4.13 on my 2016 mbp 15". I don't see any advice regarding kernel parameters for 4.13, but I think I read above some issues regarding the GPU powering off if not booting macOS. Really a hard time starting up last years mac on linux. @drocsid You're most likely running into Dunedan/mbp-2016-linux#25 . We still don't know why that happens. I'll test and push a fix in the near future. @alexpol123 If you pull the latest from my repo this is now fixed. Found the issue regarding my installs. Filevault2 disk encryption. Is anyone booting linux with Filevault2 configured? I installed rEFInd after switching FV2 off. This worked until I re enabled FV2. I'm not sure but I assume FV2 re-installed the bootloader. Anyone already using it who can share any feedback? @fannullone I upgraded to FC27 a week or so ago and haven't encountered any (new) issues. Ok, I upgraded my MBP to FC27: the process was very smooth and everything that was working before is still working. Ubuntu also used mkinitramfs instead of dracut, so use the instructions for the former. the custom EFI protocol to leave the integrated GPU powered on is not used (so that the integrated GPU is hidden). @sciamano89 Hmm, I'm sorry, but I have no clue where that OCR error is coming from - that error really doesn't make a lot of sense, so I have to assume it's due to some Linux Mint specific dkms issue. Have you checked farther up the log if there were any other errors, and this OCR error is just some weird secondary error? As the built in speakers are not working, I would like to connect my MBP running fedora27 to my stereo system. Any advice for an USB-C adapter to connect to the stereo that will work with linux? Do Bluetooth headsets output audio correctly? as a workaround for the no audio. Is it possible to use the middle-button mouse action which on a standard linux PC performs a paste of the current selection? On my Macbook Pro 13,3, I turned on debug support for SPI drivers in the kernel (drivers->spi->Debug support fro SPI drivers), just assuming this would be a good idea, and the result was GB's of kernel.log files that eventually filled up my hard drive. Just a heads up for others. @fannullone Not sure exactly what you're asking for here, but a three-finger click emulates a middle mouse button click on most setups (and a two-finger click emulates a right mouse button click). If it doesn't on your setup, you'll need to play with libinput, your desktop environment, and/or X11. @cworth Thanks for the heads-up. @arno01 Thanks for the pointer - added it to the list. Btw, any updates or ideas how to get audio working? @dolohow and @fannullone: Thanks for the apple-gmux notes - I've updated the instructions accordingly now. First off, thank you very much for writing up the instructions. I've been using fc27 on my 2017 MBP for a while. However, with the latest kernel update 4.15.15-300, it can no longer boot. The usual "rd.break enforcing=0" does not work as well. It just freezed. I have to boot into 4.15.14-300 as the work-around. I am on a macbook 14,1 running fc28. My kernel version is kernel-4.16.1-300.fc28.x86_64. I was able to get keyboard to work in the bios and after booting up, but it will not work after going through the bios into the prompt for disk encryption password. Any ideas of what could be the issue here? Under Initial Installation section, reference Andrey Arapov's instructions on remastering the installation image to have built-in support of the keyboard/mouse at the start. It does require a pre-existing installation of linux, however. I used VirtualBox for such a purpose. @rafael-azevedo: That usually means the driver (and associated modules) didn't get included in the initrd/ramdisk - double check that the 3 modules (or their compressed forms) applespi.ko, intel-lpss-pci.ko, and spi_=-pxa2xx-platform.ko are present in the initrd (e.g. using something like sudo /usr/lib/dracut/skipcpio /boot/initramfs-4.16.1-300.fc28.x86_64.img | gunzip -c | cpio -t | grep applespi). @coolguy1004 I just booted 4.15.16-300.fc27 without issues (sorry, don't have 4.15.15 anymore). @roadrunner2 has the wifi situation improved on MacBookPro13,3 from kernel upgrades? Since xorg 1.20, I have some issues with external screens on a macbook 14,3. USB-c outputs are wired with the AMD gpu, but it used to work ootb with xorg 1.19. I can see the outputs in xrandr if I play with the reverse PRIME, however xorg just crashes when I enable one of the discrete GPU output. Hello I have upgrade to fc28 and kernel 4.16.11.300; generally speaking it is working fine with the known issues, but the times it takes to shutdown is veeery long in the order of minutes, at the end the shutdown completes correctly. Any idea how to improve it? Thanks for the great instructions!! I had installed Fedora 28 on a MacBook Pro 14,1 and everything worked out of the box except for keyboard/trackpad. @fannullone I'm sorry, I don't think I can't help with that: the only time I see a hang on shutdown is when I disable the discrete GPU (the amdgpu driver gets in a tizzy then on shutdown); furthermore I don't see any UA* devices in my DSDT, so I don't know what they are. Sorry for offtopic, but is there anybody who can make and share dump from MacBookPro13,3 with DarwinDumper? I'll be reaaally appreciated. Just wanting to report that I have Fedora 28 working perfectly on my 2017 Macbook Pro 14,1 using the instructions above. Currently on kernel 4.16.14-300.fc28.x86_64. Had a bit of a scare when I upgraded from 4.16.3 as brcmfmac errored and wifi stopped working, but i realised I forgot to dracut --force the new kernel! Did that and all is well. FWIW, my wifi ( including 5Ghz ) is working. Although the 5Ghz SSID's don't always show up. I haven't had any drop outs, speeds and latency seem OK and many hours connected without issue on the BCM4350. So the comments about wifi being useless aren't true ( for the 14,1 anyway ). In Ubuntu 18.04 the installer detects HiDPI and automatically sets scale to 200% (in settings -> Devices -> Displays -> Scale). I had to switch it back to 100% to overcome a glibc error in the ubiquity installer. @Sebastiaan76: Would you mind telling me how to make wifi work? I'm on 4.17.2-200.fc28.x86_64, and I only see 2.4GHZ. However, I cannot even connect to it using the internal wifi chipset. It keeps prompting for my password. the original firmware (Ubuntu 18.04 + v4.17 custom build kernel) on MacBook Pro 2018 with touchbar. @wheelcomplex: Thank you very much. That works even though the signal is weak. But I take that. I modify the ccode=0 and revreg=0 but that did not work.